Males are light blue with dark blue stripes. A few show a thin yellow, orange, or red line on their shoulders lower body, and lower fins. A very few may show some green on the lower face like the one in the photo. Their dorsal fin has a white edge and yellow, red, or orange may appear on the rear portion of the dorsal fin as well. 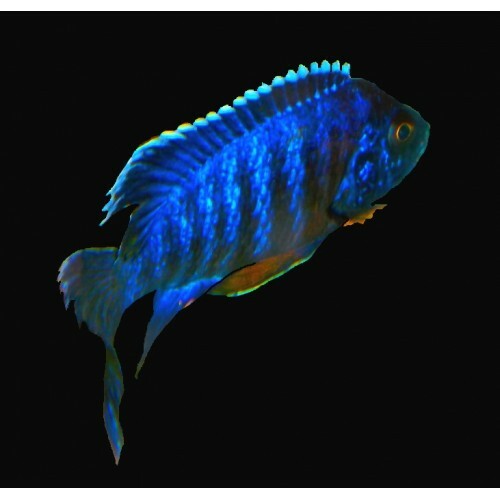 Most males are primarily blue with a thin yellow line on their shoulders, lower body, and lower fins. Females are cream with brown stripes. This is an older fish that is rarely found in the hobby. The collection point is unsure. My wholesaler claims to have received this fish from Jacob Freiberg years ago. This is one of the calmer Jacobfreibergi types. 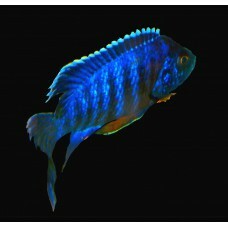 This fish is primary a larger blue peacock cichlid. Last, grow out count 04/19/2019. Next, grow out count due 05/10/2019. Grow out counts are counts of the fish in stock checking for additional males and increases in size. This fish is being discontinued from Stock at reduced prices. When it is gone it will be gone since I no longer am using the wholesaler source from which it came. Best in single male mixed tanks of 75-gallon or larger. Best mix for breeding is one male with six females. 40-gallon Breeder or larger tank recommended.